The tagline of the new movie, Extraordinary Measures, about John Crowley’s fight to save his children from the rare and fatal Pompe disease is….Don’t Hope For a Miracle – Make One! We are now working on making our own miracle – a new compassionate use investigational new drug (IND) protocol and application that we plan to submit to the FDA by April 2010. We are seeking to add intrathecal and/or intraventricular cyclodextrin delivery into Addi and Cassi’s brains to treat Niemann Pick Type C disease. We realize this sounds radical to some people but we believe that based on the data and the twins’ cyclodextrin treatment throughout 2009, we can show the FDA that doctors can administer cyclodextrin into the brain safely and that the treatment could be life-saving. Our efforts to alter our treatment protocol from bloodstream to brain may create some amount of debate. We are prepared to fight the next set of roadblocks in our efforts to save Addi and Cassi and other children suffering from this fatal cholesterol disorder. Addi and Cassi have been receiving cyclodextrin intravenous treatment (IV into bloodstream) for the past nine months. In September 2009, we stopped our weekly dose escalations and remain constant at a dose of 2500mg/kg, 8 hour treatments two times per week via IV. Since putting cyclodextrin into the brain in humans has never been attempted before, it’s going to take a monumental effort to pull together the IND application. We remain hopeful that with the world-class team of experts we are assembling to write the protocol, we can administer cyclodextrin safely into Addi and Cassi’s brains. Research funded by The Addi and Cassi Fund and Hadley Hope Fund with Dr. David Begley of Kings College of London has shown that cyclodextrin does not cross the blood brain barrier (which was under debate). However, Dr. Begley has found that cyclodextrin does not cross it may bind to the blood brain barrier which could be a key clue into how it is working. Dr. Begley will be presenting data at the Lysosomal Disease Network World Conference being held in Miami Feb 10-12, 2010. We do not see any visible outward side effects – no vomiting, hair loss, skin rashes, dizziness – nothing. The most concerning and serious side effect with cyclodextrin appears to be pulmonary issues based on the animal studies conducted on NPC cats and mice. Apparently, in cats and mice they see increase macrophage development in the lungs but researchers do not know why. We are keeping a close eye on Addi and Cassi’s pulmonary function. 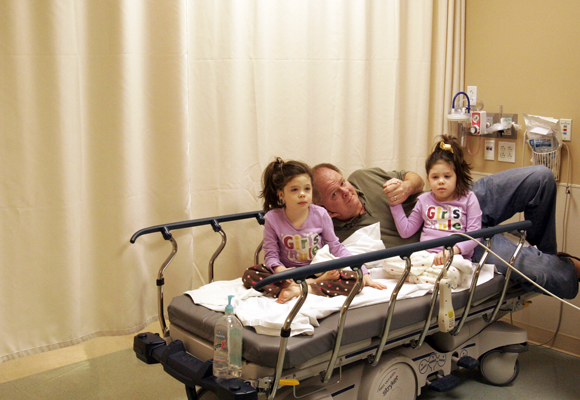 Last month, the twins underwent bronchoscopes at Children’s Hospital Oakland to look inside their lungs. I have posted the lung procedures on Vimeo for anyone to view (Addi – Cassi). According to our pulmonologist, the girls have slight scattered nodules in their lungs. Doctors believe these nodules may be xanthomas. Xanthomas can occur in people with high blood lipids but usually appear on the elbows, joints, tendons, knees, hands, feet or buttocks. Xanthomas are not a common feature of Niemann Pick Type C disease, however, there has been a case of suspected xanthomas with a child with NPC mutations. If the nodules are xanthomas, they are either as result of Addi and Cassi’s rare and private mutations or from the cyclodextrin IV treatment. Since the girls are identical twins, the only logical conclusion is genetic or cyclodextrin. Interestingly, researchers do not see xanthoma development in the lungs of cyclodextrin treated mice or cats. 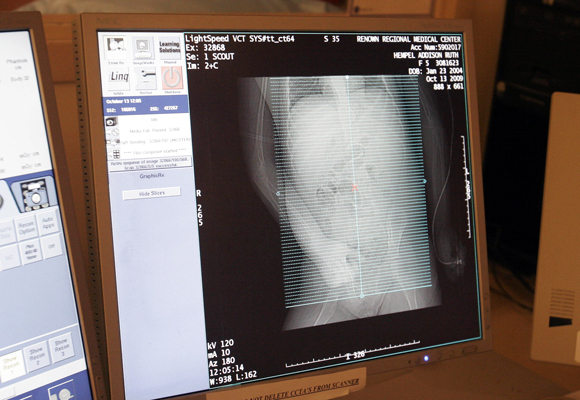 In addition, we had CT scans done on Addi and Cassi’s spleens and livers and there was no change in size. We are told by experts that this does not mean that the cyclodextrin is not benefiting their organs. On the other hand, we may not be achieving the right concentrations of cyclodextrin in the plasma. We are still trying to develop the pharmacokinetics around cyclodextrin. They don’t exist and we have to create everything from scratch. We have been in contact with top metabolic doctors in Japan and they are treating little girl with cyclodextrin. The good news is they have seen a reduction in the child’s liver and spleen size. Her liver and spleen size were 4-5cm and 7cm below the coastal margin before cyclodextrin treatment and today are 1cm and 3-4cm below the coastal margin. She showed some improvement on her EEG and has not had any adverse effects with the IV treatment. However, she is progressed and they are not seeing major neurological benefits. It is clear that we must design further treatment options with cyclodextrin to try and improve neurological function. This means delivering cyclodextrin into the brain through the intrethecal and/or intraventricular route of administration. We will never know if cyclodextrin can save our girls unless we try. Miracles do happen. Please help Addi and Cassi as we try and make our miracle. A number of people from around the world who have children diagnosed with the fatal cholesterol disease called Niemann Pick Type C have asked me how our we prepare our cyclodextrin solution for Addi and Cassi’s bi-weekly IV infusions of the compound. All hydroxy propel beta cyclodextrin (HPBCD) is not the same. It’s very important that you make sure that the cyclodextrin that is purchased is endotoxin controlled and does not have propylene glycol in it or other impurities. Essentially propylene glycol is anti-freeze – not exactly what you want to put into kids! We purchase our cyclodextrin from CTD, Inc., which is located in High Springs, Florida. The owner of CTD is extremely knowledgable when it comes to cyclodextrins and sells many different types of cyclodextrin products. The cost for his HPBCD is about $5 USD per gram. I am still working to try and make a solution that can be bottled and sent worldwide. As you can imagine, this takes time since we have no pharmaceutical company helping us with this effort. When the girls receive their infusions, there is a basic filter that the cyclodextrin funnels through (this is simply as a precaution). The filter is attached to the infusion line and as the cyclodextrin drips through the plastic line it goes through this little blue filter. I will try and find out the name of the filter we use. We are currently looking at different ways to get cyclodextrin into the body — possibly through regular subcutaneous injections as well as intrathecal methods to get cyclodextrin directly into the brain through the spinal canal. We are actively pursuing both ideas now on how this would be possible for Addi and Cassi. I continue to be very happy with how the infusions are going. The most difficult part so far has not been giving them cyclodextrin — it is being at the hospital for 2x a week all day long just sitting there watching cartoons. I am hoping the FDA will approve us to do infusions in a home setting (hopefully at night when they are sleeping) as we have not experienced any side effects. We are at 2500 (yes, 2500) mg per Kg BW and the infusion lasts 8 hours. Addi and Cassi seem to be a lot more alert and aware and have better balance and head control! I pray we can speed up research on cyclodextrin and determine the mechanism for how it’s working. For more information on Addi and Cassi’s cyclodexrin protocol, you can view our FDA compassionate use filings here. On Tuesday morning at 11am, Addi and Cassi are going to undergo volumetric CT scans of their livers and spleens. The tests are being conducted by doctors to determine if the cyclodextrin IV infusion treatment the twins are receiving under compassionate use INDs approved by the FDA are reducing the size of their enlarged cholesterol filled organs. UT Southwestern scientists have shown that Niemann Pick Type C mice organs can be restored to normal size through cyclodextrin treatment. We are soon to find out whether the same is true for children who are afflicted with this rare and fatal cholesterol disease. In all previous tests conducted on Addi and Cassi’s swollen abdomens, their spleens have measured about 12 centimeters. We are very excited and hopeful that they have reduced in size since starting the cyclodextrin infusions about 5 months ago. We also received preliminary results this week that cholesterol is being excreted in Addi and Cassi’s urine and their lysosomes are getting smaller! All positive signs and so far no negative side effects from the cyclodextrin treatment. We are now infusing 2800 mg/kg over 8 hours 2x per week — we are getting into some significant doses. Currently, my husband and I are working with a small core team of doctors and NPC parents to apply for Orphan Drug Designation for cyclodextrin (HPBCD). We intend to file our documents with the FDA in February 2010 and we are trying to get a pharmaceutical sponsor to help us. If we are unable to secure a sponsor, we will sponsor the Orphan Drug Designation filing ourselves as private citizens. Since no pharmaceutical company makes a sterile cyclodextrin infusion formulation, Adam our hospital pharmacist has to make Addi and Cassi’s formulation from scratch. For the past few months, I have been working with a cyclodextrin manufacturer in Hungary and a US based cyclodextrin supplier who can help me make an endotoxin controlled cyclodextrin formulation that can be distributed to patients worldwide. I hope to have a sterile compound available in 2010 for patients if all goes well. Just for fun, I mocked up a little bottle (using Genzyme’s Cerezyme drug bottle) with a label. We might be able to put our cyclodextrin into a plastic bag — essentially it would look like a bag of saline only it would have cyclodextrin in it. Dysfunctional cholesterol metabolism has been implicated in the etiology of many diseases from Alzheimer’s to Coronary Artery Disease. It’s amazing to think that a non toxic food additive that is also the main ingredient in Febreze fabric freshener could be the next miracle drug and might be able to save my girls lives or give them more time with us. Here you will find detailed documents outlining Addi and Cassi’s cyclodextrin infusion treatments. We filed a compassionate use IND application to the US FDA in early 2009 to give intravenous cyclodextrin treatment which was approved. In September 2010, FDA approved a new request to put HPBCD directly into the brains of the twins. Addi and Cassi’s treatment is currently being managed by Dr. Caroline Hastings and Children’s Hospital Oakland and is also monitored by the FDA. New non-drug fix for HIV? Researchers are slowly establishing a connection between an extremely rare genetic disease and HIV — and homing in on a safe, non-prescription compound that could treat both. Recently, James Hildreth at the Meharry Medical College School of Medicine in Nashville, Tenn., and his colleagues found that cells affected by Niemann-Pick Type C (NPC), which disrupts cholesterol trafficking, were unable to release HIV, suggesting these cells would not spread the virus. These findings, published May 27 in the Journal of Virology, are rooted in a hypothesis Hildreth has explored for a long time: that "cholesterol is somehow essential" to HIV, he said. For instance, HIV-1 relies on specialized structures known as lipid rafts, which are rich in cholesterol, to infect new cells. That line of thinking has led him to investigate whether a compound widely employed by the food and chemical industries (and used as a drug solubilizer) which depletes cells of cholesterol could serve as a preventative agent — or even a treatment — for HIV. And his growing body of evidence is suggesting the compound, known as cyclodextrin, might do just that. "There are very few [compounds] that rival the safety profile" of cyclodextrin, said Hildreth. If further research confirms it has an effect on a disease that affects millions of people worldwide, that would be a major advance, he noted. "It’s been exciting for me from the beginning." Cyclodextrin appears to also show some benefit in NPC, pointing further to a connection between HIV and the rare genetic disease. Indeed, a family with identical 5-year-old twins with NPC recently received permission from the US Food and Drug Administration to give the girls regular infusions of cyclodextrin. NPC leads to marked abnormalities in the liver and brain and is invariably fatal. "You have no idea what a relief it is to have something to try," said Chris Hempel, mother to Addi and Cassi. The girls have so far received several infusions, starting with one continuous 4-day infusion, and are now getting a series of 8-hour weekly infusions of increasing doses. Hempel said the girls improved remarkably after the first 4-day infusion, showing better control of their head and neck and better balance, and were more affectionate and responsive to people. These improvements waned a bit once the girls switched to weekly doses, but seem to be returning as the doses increase. In a previous experiment, Hildreth and his colleagues found that adding cyclodextrin to uninfected cells to deplete cellular cholesterol warded off HIV infection. Restoring normal cholesterol levels removed that protection. In a mouse model of HIV, cyclodextrin prevented vaginal transmission of the virus by infected cells. In a primate model, the data were somewhat less promising. When macaques received topical cyclodextrin before being exposed to the virus, the treatment appeared to prevent infection initially, but offered little protection upon re-exposure to SIV, again following cyclodextrin prophylaxis. Hildreth said that may be because the animals received a massive dose of the virus — "way more than you’d ever see in seminal fluid in a natural setting" — and the batches of cyclodextrin used for the repeated doses were not of the same quality. He said he is now repeating the study using a "physiologically relevant" amount of the virus. "We’re pretty confident." Hildreth explained that NPC is likely disrupting HIV transmission by affecting the trafficking of the viral protein Gag. "The very dramatic thing in NPC cells is the Gag protein seems to never make it to the plasma membrane." Walkley noted that his mice receive 4000 milligrams per kilogram of cyclodextrin — 10 times a recent dose the Hempel girls received — and he hasn’t noticed any side effects. However, it’s still unclear how exactly cyclodextrin is warding off NPC, which means there could be some side effects scientists have not yet discovered, he added. "Maybe there’s something going on and we just haven’t found it yet." Peter Pentchev, a retired scientist who worked with NPC for decades at the National Institutes of Health, echoed Walkley’s opinion about the promise of cyclodextrin in NPC, dubbing it the "perfect drug" for the disease. He cautioned, though, that "we know what [cyclodextrin] does, but we don’t know why or how." But scientists are working on those questions, he added. "In the next year, I’d be really surprised if we don’t get some answers." Hempel, too, has failed to notice a single side effect since her girls began cyclodextrin infusions. "We’re proving the safety of this compound," she said. "I definitely feel like Addi and Cassi are leading the way here, not only for NPC kids, but potentially for AIDS patients."